The height of buildings has been reduced at the Heller site, which will provide housing for over 2,900 upper-division undergraduates and graduate students across six buildings. Download a flier that covers some of the changes to the Heller Drive site. As proposed, family student housing and a child care center would be built at the intersection of Hagar and Coolidge drives. 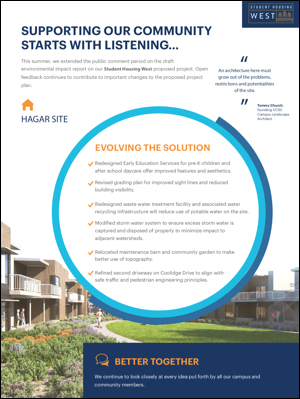 Download a flier that covers some of the changes to the Hagar Drive site. 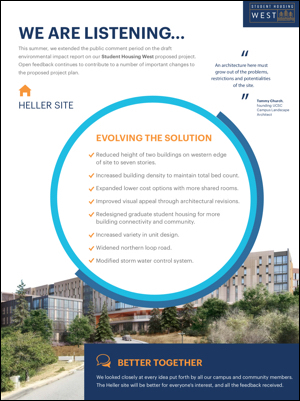 UC Santa Cruz has issued a revised draft environmental impact report for the proposed Student Housing West project for public review and feedback. Earlier this year, UC Santa Cruz prepared and circulated a draft environmental impact report (EIR) for the project. After receiving more than 350 comments on the draft EIR, UC Santa Cruz has made a number of changes to the project, provided additional analysis and discussion, and evaluated additional alternatives suggested by members of the public. Oct. 23, from 6:30-8:30 p.m., at Louden Nelson Community Center, 301 Center St. 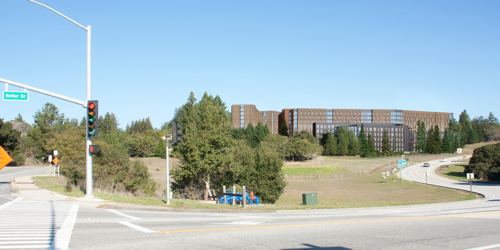 Under the revised proposal, Student Housing West will create 3,072 new beds at two sites on the UC Santa Cruz main campus, one along Heller Drive, the other along Hagar Drive. The first comment period, originally 45 days, then extended an additional 45 days or so, generated more than 350 comments. UC Santa Cruz made a number of changes to the project in response to the feedback and also considered additional alternatives as suggested by members of the public. The height of buildings has been reduced at the Heller site, which will provide housing for over 2,900 upper-division undergraduates and graduate students across six buildings. This was achieved by revisiting the design of unit configurations to allow for a higher level of density while also developing a new unit type that is more affordable for our students. Two of the undergraduate buildings along the western edge are now planned to be seven stories tall. They were first proposed to be eight to 10. Two of the other undergraduate buildings at the Heller site will vary from five to six stories, down from five to seven in the original proposal, while the last undergraduate building will remain at five to seven stories. The two graduate buildings at the southern end of the Heller site will be five to six stories. As indicated earlier, a new unit configuration was also developed based on feedback from undergraduate and graduate students who sought increased co-housing configurations with shared kitchens and living rooms. The new configuration provides a higher level of affordability. The project will continue to include a student hub with retail space, a fitness room, multipurpose space, meeting rooms, and more. The Hagar site will create 140 new housing units for students with families, as well as an expanded child-care center that will serve the children of faculty, staff, and students. The children of students are currently the only children eligible for care. The Hagar location was selected for several reasons, including its proximity to existing employee housing, the main campus entrance, and Westlake Elementary School. A revised grading plan for the site has also benefited the Hagar location by reducing the visible height of some buildings along Hagar and Coolidge Drives. The campus is also taking a revised approach to stormwater management to mitigate potential impacts to Kalkar Pond, off Spring Street. Following the original public comment period, UC Santa Cruz is analyzing other alternatives to the project proposed by the public to determine if they could meet the project objectives, which include supporting the student experience and keeping the housing affordable. The pairing of the Hagar and Heller sites remained the best proposed approach, Blumenthal said. “I appreciate everyone’s interest in this project, and I believe it is better for all the feedback we received,” Blumenthal said. “We looked closely at every idea put forth. At this point in the process, we believe the proposal to build at the Hager site will best serve our current and future students. The proposed project design minimizes the environmental impact and will allow us to keep our campus housing costs down. The campus plans to take Student Housing West to the UC Board of Regents for approval in January 2019. The goal is to open the new community for family student housing in spring 2020, and to begin opening new buildings at Heller Drive in fall 2022 with full project completion by fall 2023. The draft environmental impact report and additional renderings of the project are available online. More information on the project can be found at ucsc.edu/shw.